The author is a forage specialist at the University of California, Davis. The 2013 to 2015 drought centered on California and Nevada has been termed “Exceptionally Severe” by USDA scientists, and has brought home with a vengeance the importance of water for alfalfa grown in Western states. Many acres of alfalfa have been dried down, fields abandoned or partially irrigated, and profitability greatly reduced. It has not been a happy time for alfalfa producers in areas of exceptional drought. According to the 2012 USDA Census of Agriculture, nearly 50 percent of U.S. alfalfa is grown in the West, and mostly under irrigation. Alfalfa is primarily irrigated with sprinkler irrigation systems (pivots and wheel lines) and surface irrigation systems (also known as “check flood”). In California, about 80 to 85 percent of production is accomplished with surface irrigation systems, while 15 percent use sprinkler systems of various types. We think that about 2 percent utilize subsurface drip, a number that was very close to zero only six years ago. However, there is strong interest in more efficient water-use application systems, given the dynamics of water supply and the potential to improve yields. Growers are looking for all the tricks in the book to deal with the need for higher yields as well as the need to save water. While drip irrigation and micro-sprinklers are widely used for many other crops, these techniques have not been as widely used for alfalfa. About 15 years ago, California’s tomato processing industry began experimenting with subsurface drip irrigation (SDI), an effort aided by University of California research. This enabled growers to more carefully finesse irrigation amounts so that they didn’t over-irrigate (too much vegetative growth) or under-irrigate (limiting yields). The results have been astounding — improving yields over this period from 20 to 50 percent compared with surface systems. Currently, well over 80 percent of the approximately 260,000 acres of California tomato crop is using SDI, driven largely by profitability factors, as well as the ability to carefully use water. Can SDI work for alfalfa? The answer is not immediately clear. Alfalfa is fundamentally different than tree, vine or row crops because of its broadcast growth pattern, deep roots and frequent harvests. Over the past three- to five-year period, we have been observing and surveying installation of drip systems on more than 16 farms in California and Arizona, and conducting controlled studies of SDI on our university research farms. This has been a tremendous learning experience — we are learning from growers as they learn how to adapt this technology and providing suggestions on how its success might be improved. The learning curve is ongoing for everyone involved. Subsurface drip irrigation is defined as the application of water below the soil surface through spaced emitters embedded in drip tubes with discharge rates generally in the same range as surface drip irrigation. Generally, growers install drip lines at 8 to 14 inches below the surface at 30- to 40-inch spacings, though some space lines are up to 60 inches. A filtration system and pumps to pressurize the system are also required. The ideal lateral drip spacing and emitter spacing are dictated by soil type and economics. Most of the systems we have observed source water from wells, whereas some have surface water sources; in the latter case, settling ponds or small reservoirs may be necessary to improve reliability of water supply and enable settling of suspended particles. The major advantage of drip irrigation is that smaller amounts of water can be applied. The system essentially “spoon-feeds” the crop with just enough water to meet crop demand. Yield: It is quite likely that alfalfa yields may be improved utilizing SDI in alfalfa versus flood irrigation. Growers in the long-seasoned environment of Central and Southern California and Arizona have reported yields averaging 3.1 tons per acre over their check-flood fields, at least in the first several years. Experimental data has reported 20 to 35 percent increases in yield versus surface systems in controlled studies. Why is this? A lot has to do with distribution of water in time and space. Distribution uniformity over space: Check flood systems have built-in problems with uniformity due to greater times available for water infiltration at different places in the field. Often, water in flooded fields needs to move 1,350 feet, which takes 10 to 14 hours; different amounts of water are provided in different sections. One of the key advantages of SDI systems is to apply water more uniformly across a field. Distribution uniformity over time: SDI has the ability to quickly apply a uniform irrigation to an entire field, within 24 to 48 hours. This is not possible with most surface systems. Depending upon flow rates, many surface systems require from three to 12 days to irrigate an 80- to 100-acre field. One side of the field may get water much later than the other side. Wheel-line and hand-move sprinklers (but not pivots) also have this limitation. Providing a “Goldilocks” amount of water as needed: In surface systems, a slug of 3 to 6 inches of water must be applied at a time in order to push water down the field. To allow for a 14-day dry period before and after harvest, only one or at most two floods are possible between a 28-day harvest interval. Often either too little or too much water for the true need of the crop is applied. With SDI, if only 1/4 inch is needed, water can be applied daily to meet crop need, and closer to a harvest. Preventing wetting-drying cycles: SDI provides a constant amount of water to the roots, preventing the excessive drying or wetting of soil and maintaining turgor. Additionally, it prevents cracking clays from damaging roots, a common problem on heavy soils. Oxygen availability to roots may be improved, depending upon soil and management. Weeds/stand longevity: There is some evidence that SDI fields are likely to reduce weed intrusion due to less standing water and dry soil surfaces. Additionally, stands may last longer due to less stand loss and less soil cracking. Crop rotation: Alfalfa SDI fields are often rotated with crops such as corn, wheat, cotton or tomato over a six- to 12-year period. This enables the system to remain in place, optimizing return on investment. Water quality and evaporative losses: Properly designed and operated SDI systems have low evaporative losses (due to the low evaporation off of relatively dry soils) versus surface or sprinkler systems. Additionally, SDI systems result in zero runoff. Water savings: Depending upon the efficiencies of the system to which it is compared, water savings can be substantial, especially on sandy soils. Surface systems are inefficient when significant water goes below the root zone or runs off and is not captured for another use. Labor: SDI systems have the promise of reduced labor requirements, and this has been demonstrated on several farms. Certainly, a well-designed system can be nearly fully automated, compared with many surface systems, which require full-time irrigators. However, additional labor is likely to be required for scouting for rodent infestations and fixing leaks. 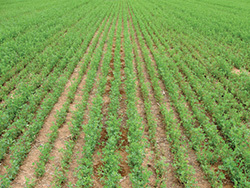 Alfalfa regrowth is often more rapid in an SDI-irrigated alfalfa field. Water can be metered as needed throughout the growth cycle. Costs: Historically, the cost of SDI installations has been a major disadvantage. System installations range between $1,000 and $2,700 per acre, depending on the farm. However, these costs can be justified if yields are improved and/or price of the product is sufficient to cover costs. We estimated that the yield required to justify the cost is between 0.5 to 1.5 tons per acre, depending on actual costs and the price of hay. Rodent damage: Rodent damage, particularly the potential for gopher damage, is probably the key practical disadvantage and main barrier to SDI technology adoption. Some growers have “walked away” from large investments due to rodent infestations. Alfalfa, particularly sprinkler- or SDI-irrigated alfalfa, is an ideal habitat for gophers. 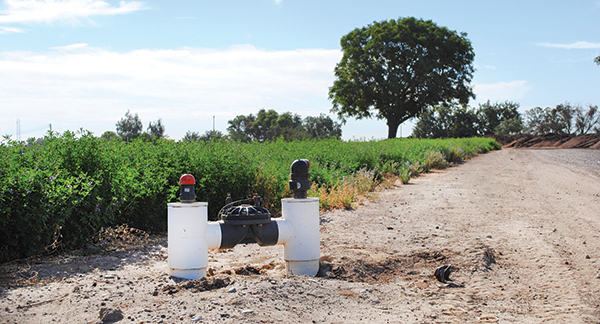 While rodent damage to alfalfa stands is likely no different in SDI compared with sprinklers, at least in sprinkler-irrigated fields it does not ruin the irrigation system. High levels of management are required to manage rodents. Salinity: Salinity may be an important limitation for SDI systems. Buildup of soil saline conditions could occur between drip lines, or at different levels of the soil, if steps are not taken to control salinity. Need to retain diverse water application methods: Growers should try to retain multiple methods of water applications in their SDI installations, including the ability to flood irrigate and/or sprinkle irrigate. Sprinklers should be used for stand establishment, while occasional flood irrigation is needed for salinity management, filling the soil profile and rodent management. Although there is a lot to learn about SDI for alfalfa, it has the capacity to improve yields and water use efficiency. The key advantages are to 1) maintain continuous water supply and better soil moisture conditions, 2) enable better distribution uniformity over space and time for both water and nutrient applications, 3) prevention of wetting-drying cycles and 4) longer potential stand life and less weed pressure. SDI may not be well suited to every situation — the key limitations of SDI methods include cost of installation, source water quality, and management of rodent damage to the system. The latter can be devastating. Although one must be cautious about its limitations, the ability of SDI to achieve higher yields in practice should be viewed as an important strategy for increasing water use efficiency of irrigated alfalfa production systems for the future. This article appeared in the November issue of Hay & Forage Grower on page 8.